Life of a Catholic Librarian: Happy Feast of St. Isidore the Farmer! 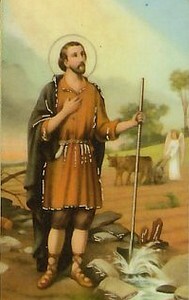 Happy Feast of St. Isidore the Farmer! May 15th is the feast of St. Isidore the Farmer, patron of this humble blog for the year 2013. :) Interestingly, he has become a favorite of Henry's since he appears in one of his children's saints books. He has requested that I read St. Isidore's story at least a half dozen times this year, and I can't help but think that this saint has taken a special interest in our family. Henry was all excited today that since St. Isidore was specifically noted in his school planner, this means that the principal will read his story during the morning announcements. Precious. "Isidore has become the patron of farmers and rural communities. In particular he is the patron of Madrid, Spain, and of the United States National Rural Life Conference. He died May 15, 1130, and was declared a saint in 1622 with Ignatius of Loyola, Francis Xavier, Teresa of Avila and Philip Neri. Together, the group is known in Spain as 'the five saints.'" Henry's saint book notes that sometimes angels were seen to be pushing the plow in St. Isidore's absence, this is one of his favorite parts. Stories of saints from centuries ago are rife with these pious details, and I always make sure to tell Henry that while some such specifics may simply be legends, the person was definitely real and holy in their example. Did anybody else contemplate becoming a nun? Happy Feast of the Ascension!